Like the phrase computer literacy is not limited to the limited ability to switch on, switch off a computer to simply use a program like Microsoft Word, the phrase data literacy has no well defined limit. What is Data Literacy? In simplest words, data literacy is the ability to understand and utilize data effectively in the context of data collection, data sharing and analysis. Data literacy is just what it sounds like: familiarity with data and its uses. For various reasons, practically all of the citizens, students, computer users should pose a minimum data literacy. However, in the context of professional statistical and data analysis works; data governance and data literacy are building blocks in the knowledge base of the professionals. In this article, we will discuss minimum for the future information professionals who are likely to be involved in data quality and research data management. So in professional practice, data literacy refers to a professional’s ability to understand and utilize data effectively. This term was largely unknown even two decades ago. However, now it is one of the most important skill both for the individuals and the enterprises to have. Building a data literate workforce is not easy, and advancing onto data fluency is not either so. However, the skill-sets are essential for any company which hopes to stay competitive and relevant in the maret. Here are some strategies for building a company-wide culture of data literacy. 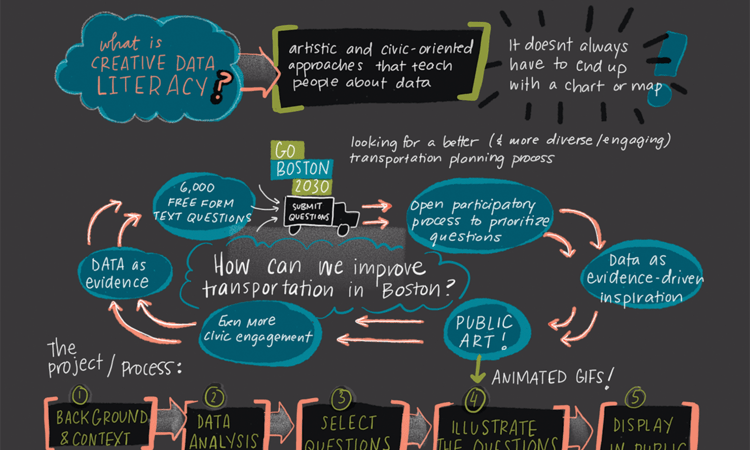 Graphics created by Kanarinka, for Creative Data Literacy at Tapestry Conference 2017. Based on the existing literature and expert input where data literacy pointed towards the ability to collect, manage, evaluate and apply data in a critical manner, we started from the definition From that point of view, it becomes a required ability in the knowledge-­based economy. Our decisions are now lead by data. The process how to collect, manage, evaluate, and apply the collected data to support an evidence based decision making increasingly being required in many jobs. Also, data literacy reveals the ability to recognize the importance of ethical guidelines in personal behavior on web, real life. Unfortunately, current education system is inconsistent in the context of delivering data literacy across the twelfth-grade to graduate institutions. Our considerations of developing a working knowledge of data literacy and apply the skill-sets appropriately at present is specialty specific. The emergence of data and analytics capabilities, including artificial intelligence, requires creators and consumers to “speak data” as a common language. It is important for the students/employees to understand why data is so important if a data-driven culture is going to take over. Education and training helps to underscore this message while developing important data literacy skills across the workforce. It is unrealistic and unreasonable to expect the students/employees to pick these skills up on their own, which is why it has to be an enterprise-wide initiative. Data is often vast, varied, and disconnected, which leads inevitably to confusion and conflict. In order for everyone in an organization to be data literate, they must rely on the same information. Otherwise data is different to different departments/students/employees. Integrating all data on a single platform ensures that the students/employees know where to find information and feel confident that information is complete. Every company defines what data, metrics, opportunities and obstacles are important for themselves. A data dictionary defines what these priorities are so that misinterpretations don’t hold back communication and collaboration. Once developed, a data dictionary serves as a one-stop reference that helps to homogenize data-driven initiatives across an organization. Historically, only a selected number of specialists and executives had access to critical company data. This is the part of why data literacy now suffering. But also the fact is that, now data is more accessible and better understood, it is important for wide swaths of users to have data at their disposal. Relying on data-exploration tools like relational search ensures that average users do not become overwhelmed with the details of data science. Data literacy is only valuable when it leads to more objective and empirical decision making. Unfortunately, people who are set in their ways will continue to rely on assumptions and intuitions instead. Holding decision makers accountable creates a lot more onus to act with caution and certainty. Over time, data becomes an asset that these decision makers are eager to understand and utilize. For the benefit of the employers (and the society), data literacy must be recognized as a basic skill. Elements of data literacy is necessary in undergraduate curriculum for the sake of consistency in basic knowledge. If there is any doubt that data literacy is a mission critical skill, we need to consider the recent surveys of the executives. More than 80 percent of the respondents had launched an analytics or big data initiative. By all accounts, this is the skill that will either drive future success or cause future failure. If we want to be on the former half of the equation, data literacy is essential. This Article Has Been Shared 7453 Times! Here is WordPress Interactive Python Widget For Python With DataCamp Light For Peoples Who Hunt Something Like JSFiddle For Jupyter Notebook. Many Are Interested to Learn Big Data Analytics and Other Works But Clueless Where From to Start. Here is How To Learn Big Data For Beginners. How to Install Apache Ignite on Ubuntu Depends on the Purpose. Apache Ignite is a distributed database, also is a caching and processing platform. Cite this article as: Abhishek Ghosh, "What is Data Literacy And Why Data Literacy Matters," in The Customize Windows, September 19, 2018, April 21, 2019, https://thecustomizewindows.com/2018/09/what-is-data-literacy-and-why-data-literacy-matters/.